I’ve seen more and more press releases from this weekend on how Syria is different from Iraq, or Libya, that we must act. Funny coming from Sen Kerry who was against action in Iraq, despite UN Sanctions which we don’t have here, that this time we must act. Libya has plunged unnoticed into its worst political and economic crisis since the defeat of Qaddafi two years ago. Government authority is disintegrating in all parts of the country putting in doubt claims by American, British and French politicians that NATO’s military action in Libya in 2011 was an outstanding example of a successful foreign military intervention, which should be repeated in Syria. … Output of Libya’s prized high-quality crude oil has plunged from 1.4 million barrels a day earlier this year to just 160,000 barrels a day now. I keep reading about how Iraq was the bad war and Libya was the good war and Afghanistan was the necessary war and Bosnia was the moral war and Syria is now another necessary war. Guess what! They are all the same war. They are all the story of what happens when multisectarian societies, most of them Muslim or Arab, are held together for decades by dictators ruling vertically, from the top down, with iron fists and then have their dictators toppled, either by internal or external forces. And they are all the story of how the people in these countries respond to the fact that with the dictator gone they can only be governed horizontally — by the constituent communities themselves writing their own social contracts for how to live together as equal citizens, without an iron fist from above. And, as I’ve said before, they are all the story of how difficult it is to go from Saddam to Jefferson — from vertical rule to horizontal rule — without falling into Hobbes or Khomeini. He goes on further discussing the same dangers I have in previous posts about there is no political entity that is ready to take over should Assad be toppled or removed from power. If we were to decapitate the Syrian regime from the air, the same thing would likely happen there. For any chance of a multi-sectarian democratic outcome in Syria, you need to win two wars on the ground: one against the ruling Assad-Alawite-Iranian-Hezbollah-Shiite alliance; and, once that one is over, you’d have to defeat the Sunni Islamists and pro-Al Qaeda jihadists. Without an army of the center (which no one will provide) to back up the few decent Free Syrian Army units, both will be uphill fights. The center exists in these countries, but it is weak and unorganized. It’s because these are pluralistic societies — mixtures of tribes and religious sects, namely Shiites, Sunnis, Christians, Kurds, Druze and Turkmen — but they lack any sense of citizenship or deep ethic of pluralism. That is, tolerance, cooperation and compromise. They could hold together as long as there was a dictator to “protect” (and divide) everyone from everyone else. But when the dictator goes, and you are a pluralistic society but lack pluralism, you can’t build anything because there is never enough trust for one community to cede power to another — not without an army of the center to protect everyone from everyone…..
Each tribe or sect believes it is in a rule-or-die struggle against the next, and when everyone believes this, it becomes self-fulfilling. That means Syria and Iraq will both likely devolve into self-governing, largely homogeneous, ethnic and religious units, like Kurdistan. And, if we are lucky, these units will find a modus vivendi, as happened in Lebanon after 14 years of civil war. And then maybe, over time, these smaller units will voluntarily come together into larger, more functional states. They are tough words, but if we “change the momentum on the battlefield” we need to be prepared to get more involved for quite some time. 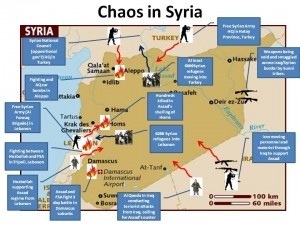 Is Syria different on the ground? No. It will take enormous effort, money, and blood before Syria would be stable enough following the collapse of their government. It would take help from the Arab League, NATO, EU, The UN, none of which is stepping up yet. …. the proposed strike is unlike anything that has come before — an attack inside the territory of a sovereign country, without its consent, without a self-defense rationale and without the authorization of the United Nations Security Council or even the participation of a multilateral treaty alliance like NATO, and for the purpose of punishing an alleged war crime that has already occurred rather than preventing an imminent disaster. If you remember the Bush reasoning for Iraq, it was expanding our authority to strike to prevent an imminent attack. There was also a decade of UN Sanctions not upheld. Is it War, or does it Matter? “Constitutionally, every president, Republican and Democrat alike, has always reserved to the presidency, to the commander-in-chief of the armed forces, the right to make a decision with respect to American security,” Kerry said during an interview in his State Department reception room on Thursday. So do they need Congress? I don’t know. Apparently they want a scapegoat if it goes south.. Otherwise , (tic) well, you better vote for it Congress, or the President might do it anyway..
Are we going so that we can save the people and provide peace like Kerry states in his interview or are we going to uphold the “international laws” against chemical weapons that Syria has never signed? Oh yeah, and without UN backing or any sort of NATO or Coalition force. Somehow we will also do it with limited strikes that will “punish” Assad but somehow not destabilize the security of the weapons. (or destroy them for that matter) Never mind our tired military since 9/11, limited stockpile of tomahawk missiles (well over a $1 million a piece), sequestration, and a Congress that never passes a military fiscal budget before a fiscal year starts. Even larger in the debate, doesn’t military action without international sanctions violate “international law” ? What would we call it if another country fired missiles our way? …. I know what the Syrians will think of it. Will this “non-war” punishment make a difference to Assad? I doubt it. Would it have made a difference to Qaddafi? Oh yeah, it didn’t matter there either. He would fight to the death like Saddam. Will this change the momentum on the battlefield? Perhaps 3 days of strikes could. But who will take charge? Who has the best weapons and is the most brutal? I let you answer that. But if we “degrade” the structure for controlling those weapons, how do we keep them from getting into the wrong hands without some kind of on-the-ground involvement? Let me give you the reverse question. If we don’t send this message to Assad that this should not be used, and if we don’t strengthen the opposition over a period of time through the support that the world is giving to them, and the United States backs off of sending this message, there is a much greater likelihood that those weapons will fall into the hands of the bad guys and a much greater likelihood that you will have a lot more of them, because those are the people who are going to get the support to remove Assad. But the specific question is, if you degrade the delivery systems, how do you keep those materials from getting into the wrong hands? By being very thoughtful in your selection of what you do, so that you do not undo his ability to be able to maintain and guard the actual stockpiles. Stockpiles are spread out in various parts of the country. And we know where they are. And the United States is obviously going to be very careful not to do something that makes matters worse. So to summarize his answers, Sen Kerry believes the chemical weapons are more likely to fall in to the wrong hands if we don’t strike. Don’t worry, he’s not going to strike anything that affects the chemical weapons or their security. As he says, he’s talked this all through. Really? Thats our assurance? You’ve talked it through? Sorry, I’ve seen post strike Iraq, Afghanistan, Libya, and you think it will be alright? Did those work out as planned? Uh, no. In the end I feel like I’m on a roller coaster from the White House. A year ago chemical weapons are a red line. A year later 100k Syrians are dead with perhaps a million refugees and we don’t say anything until Syria’s second chemical attack. My question is, what is next in the plan?